Naturally, Hata has to ride the Hestia bandwagon. Synopsis: While Hayate is away from the cabin, Tsugumi comes in and produces a whiteboard and proceeds to explain to Nagi as to why Hayate will die if he wins the 150 million yen. Just in case the Nagi service from the previous chapter wasn't enough. 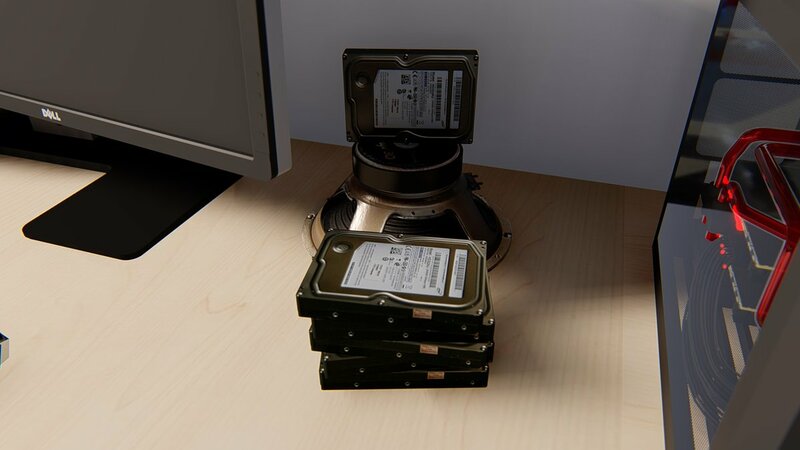 Have a little bit more. According to the half-pint, the first thing that Hayate will do would be to retire as a butler. Nagi hesitantly counters this by proclaiming rather uncertainly that Hayate will stay with her because he has feelings for her. Tsugumi plays along with this and continues her story using Nagi's proclamation as leverage, she says that Hayate would become a NEET if he stays with a rich girl like her and then they'd do nothing but flirt all day. After three months, Hayate would get tired of her and start fleeting from girl to girl and this cycle will continue until he is eventually stabbed to death. 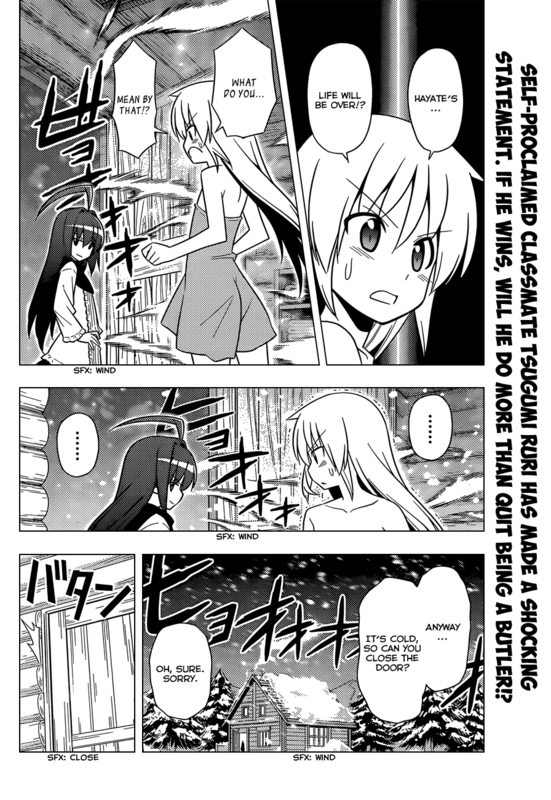 As ridiculous as this story is, Nagi instantly buys it and goes along with Tsugumi's suggestion to win the race herself without Hayate and she's even prepared a change of clothes and a snowmobile for Nagi because if a butler-driven sled is fine, then anything goes to win this race! 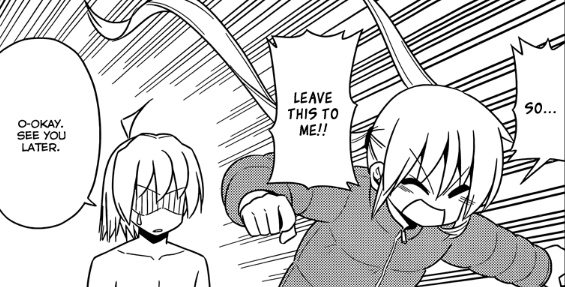 When Hayate returns, Nagi has already changed and is all set to win the race and save him from becoming a NEET! -- which she tells him as well. Of course, the clueless butler is as clueless as ever. Anyway, Nagi proceeds on her own with Tsugumi still egging her on. Hayate himself can't go out yet until his clothes are dry. Some time later, in the next cabin, Hina's enjoying the sauna because she fell into a river as well... while following the signs! Hayate suddenly comes in and shows off his abs to the audience... but it's just a two-pack coz he's super skinny (lol). 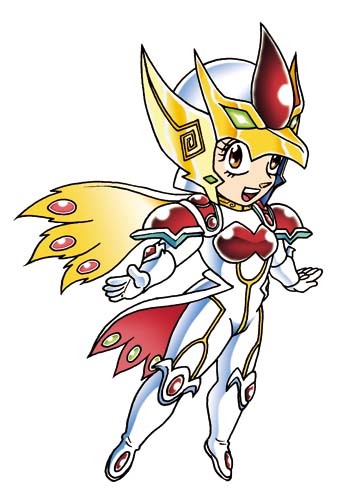 Clearly, the superior genes went to Ikusa. Anyway, Hina hides on instinct and she turns it into an unofficial sauna competition to see who can last longer inside (innuendo is intentional, mind you). Of course, Hayate, who is completely unaware of her presence for now does have an advantage since she's already been in there for 10 minutes. Suddenly, Hayate's completer goes off revealing that people are dropping off the competition one by one. Review: Well, here's a rather interesting reveal. 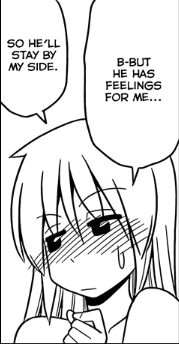 It seems that Nagi still thinks that Hayate's in love with her or at least has "feelings for her," which wouldn't be too far off the mark, actually. So does this mean that she's still misunderstanding his initial confession? It could very well be, but I think the panel where she says that "he has feelings for me" says something else. This is just speculation on my part, but it appears that Nagi's rather uncertain about Hayate's feelings for her, which is why she stammers before replying to Ruri Tsugumi. On that note, this is also probably one of the main reasons why someone as smart as Nagi would fall prey to Tsugumi's obvious manipulative lie. Nagi wants to believe that Hayate has feelings for her and since Tsugumi's story takes her word for it as fact, Nagi's convinced herself that believing in Tsugumi's nonsensical story and acting upon it is the best thing that she can do for Hayate right now. 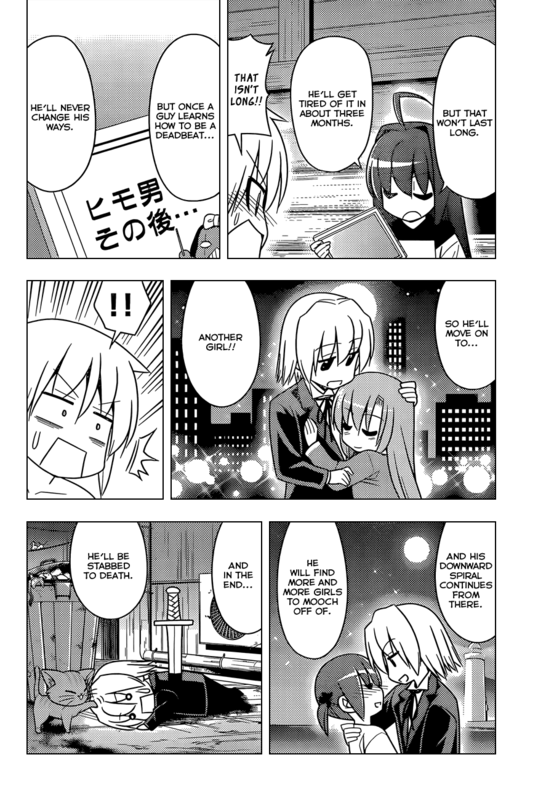 In short, she's super gullible when it comes to Hayate. Who knows? She might be right! Anyway, it's an interesting plot twist and it seems that Nagi doesn't have it in her to be directly antagonistic to Hayate at all, which is why she just goes along with Tsugumi's plan and doesn't even think about just telling him to quit or sabotaging his chances in one way or another... of course, Tsugumi could still suggest that at some point. You're not even going to go after her? What kind of man are you! It seems Tsugumi's after something and that it involves Nagi somehow, but not enough has been revealed just yet for me to make any concrete speculations. Also, either Hata's double-trolled us again by not having Hayate see Hina naked... again, or he's just delayed it for the next chapter. By the way, did anyone else think that Ruri Tsugumi's story involving Hayate fleeting from one girl to another and eventually getting stabbed was an allusion to School Days? 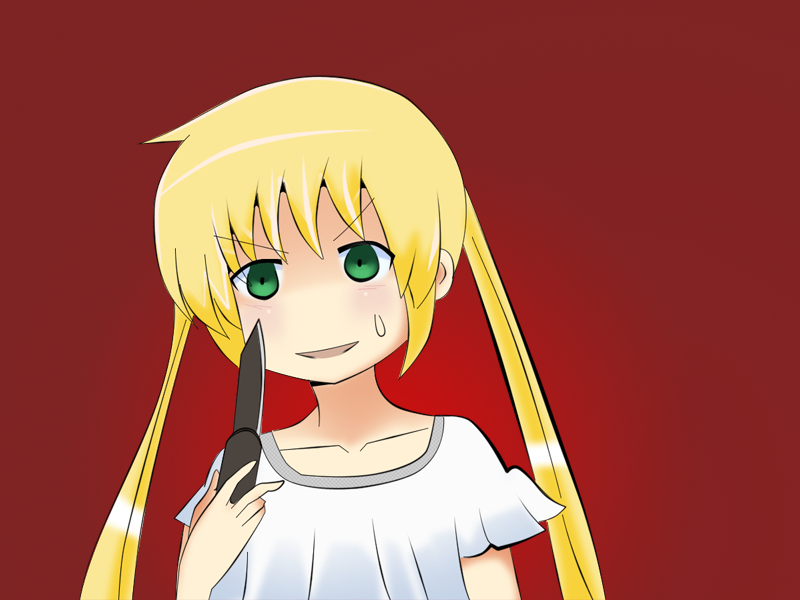 If so, I'd imagine it'd be Nagi doing the final stabbing like so. As to the actual competition, I'm sure that most of us are in agreement that rather than who actually wins the competition (which might be averted anyway), what is more important right now is what is actually going on behind the scenes including Kananiwa and Tsugumi's respective motivations for their actions. I have no idea why this is happening and not enough data to speculate about anything... except maybe the Prison Hotel wasn't a hotel. Anyway, this was an interesting turn of events and I'm hyped for the next chapter. Before that however, I'm set to do a little Nagi-centric essay... which will be posted in this blog real soon. This is my facebook if you want to add me and we can talk about all these, if you want.